Happy Weekend everyone! We’ve got great news…The Gacha Garden is NOW open! This round marks the Garden’s 2nd Birthday, and they are celebrating in a big way. The event features over a 100 new gachas and tons of free gifts. It took poor Lucy 2 days to sort through all the freebies. Lucy picked her favorites to share with all of you. Almost all of the gifts pictured here can be resized. Which is exactly what Lucy did to the Moonicorn and Teddy Bear Rug. There is a little something for everyone at the Gacha Garden. Lucy found several nice hairstyles, a great little dress, a crown, and a sweet necklace on top of all the fun furnishings. 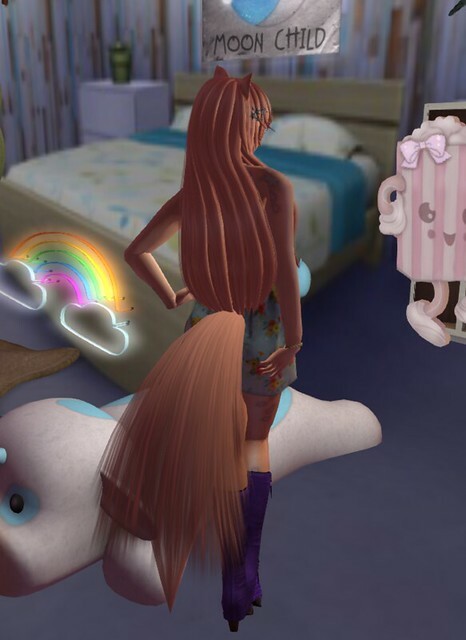 Lucy also found a nice modifiable fox tail in the marketplace, and colored it to match her hair. To complete the outfit Lucy scoured the marketplace and found the perfect boots in a Fizz Bomb & Pom Poms outfit freebie. TIP: Keep an open mind when looking at freebie outfits in the marketplace. The outfit style at first glance may not appeal to you, however the accessories included in the box can turn out to be real gems.